What is Software Piracy or Copyright Infringement of Software? What should be done to prevent software piracy? Using, modifying, distributing, selling a software without proper license or permission or right is termed as software piracy. A software should only be used as per its license. When a software is covered with copyright laws and gets used in a way that violates one or more conditions, then this use of the software is a copyright infringement of software and this is software piracy. 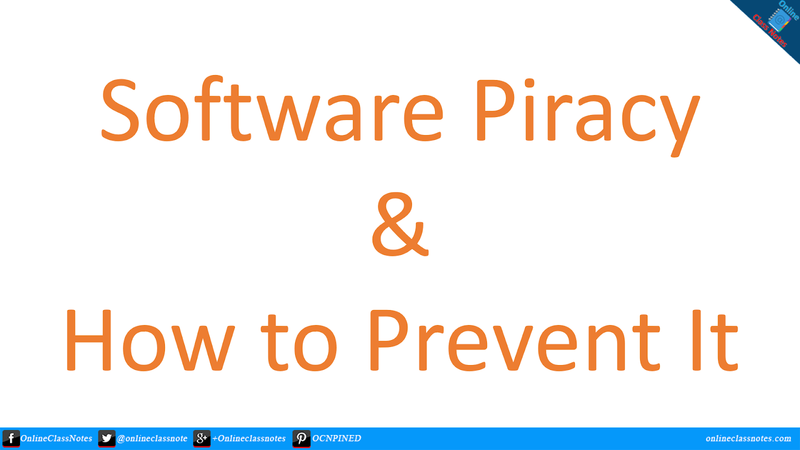 Following are 4 steps which can be applied to stop or prevent software piracy. First of all, this has to be considered that many people may not be aware of software piracy. Thus it is important to build awareness among the software end users about what is software piracy and what are the impacts of using pirated software. When users will be aware of this illegal use of software they will start avoiding pirated software. Though awareness is important but reporting the use of pirated software to the respective authority would be much more effective. Authority, that is the owner of the software or the law enforcement must be reported as soon as a use of pirated software is noticed. Thus the authority can take action against it and prevent piracy. Proper privacy should be maintained which a software is in development. This should be done from developer level to the owner level. Also while distributing, necessary steps should be taken to identify real user who bought license for using the software. This ensures that software was not stolen in development or distribution entirely or partially. Intellectual Property Right or Copyright laws should implemented against anyone involved with software piracy. This will alert other users that they should not use pirated software or should not be involved in software piracy.